My wife and I wanted something different. We decided that taking vacations to places that offer “amusements, attractions, and fun for the entire family” along with, perhaps, long lines, high prices, plenty of junk food, babies and buggies, is just not for us. We also feel that we have “been there and done that” in terms of rum-soaked “adult” beach resorts with lots of pop music and plump, pushy party animals. We’ve even been on cruises that felt like a combination of these two kinds of vacations. For our most recent adventure, we were looking for a healthy, eco-friendly alternative- a way to stay in shape and hone a skill, and also maybe a chance to get some continuing education in our fields. 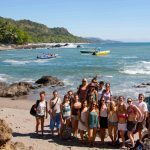 Since we love to travel to distant places but hate having to turn right around and come back, and we had been eyeing Costa Rica, we decided to do an “immersion” trip that would last a lot longer and really give us a taste of that country. And since my wife is a Massage Therapist and I’m a Landscape Architect, and we’ve both been enjoying Yoga for a while, we decided that a Yoga-teacher training retreat at an “Eco-Resort” was just the thing for us. What is it? Let’s assume you’ve heard of Yoga, the meditative mind-body discipline and gentle exercise/stretching program that originated in India and has been around for over a thousand years. If you are new to Yoga, you might wish to experience an “immersion” training that will get you set you on a new and more consistent practice path. My wife and I had tried a variety of classes and videos- each had a different focus and we did not feel that we were learning any particular system, so we wanted to get more settled on one. If you have been practicing Yoga for a while, you might simply be ready to take your personal practice to a much higher level by learning a lot more about the anatomy and philosophy of Yoga, in addition to many new poses. If you are already teaching Yoga to others, you might wish to add value to your classes by bringing in new ideas, new poses, and new information for your students. 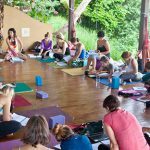 What better way to immerse yourself in a healthful, relaxing exercise program, pick up a new skill, and get away from it all for a long tropical vacation than to commit to a four-week yoga teacher certification class in a beautiful, eco-friendly place like the Central American country of Costa Rica? 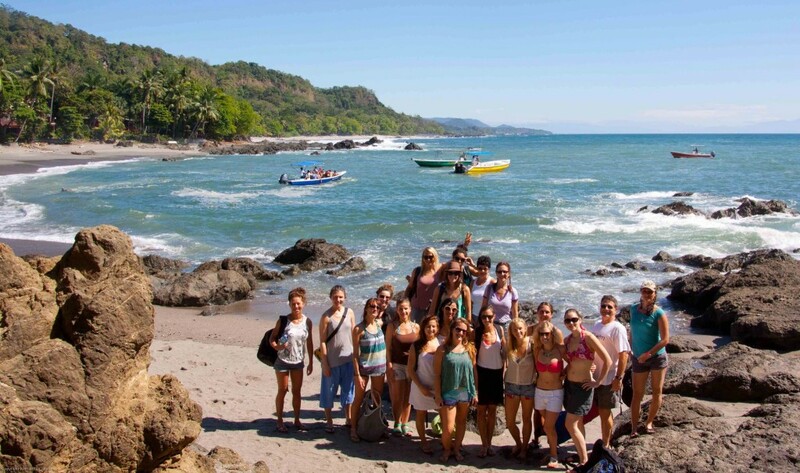 You already know that Costa Rica is one of the premier vacation destinations in the world, with a warm climate, glorious golden sand beaches, friendly people, lush jungle preserves, plentiful wildlife, and a stable democracy. 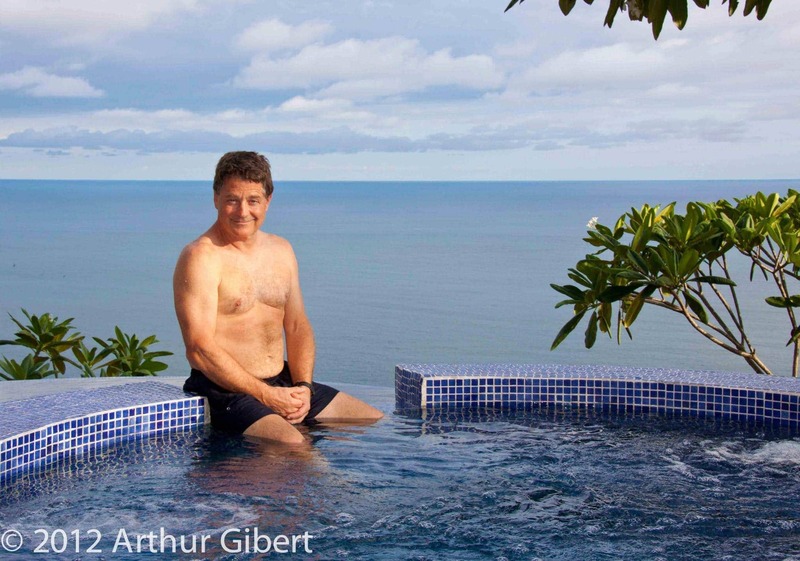 But did you know that Costa Rica has high-end resorts that cater to the health-conscious traveler with gourmet, organic meals and a variety of fitness programs? Some of these resorts offer Yoga classes, but one, Anamaya Eco-Resort and Conference Center, high on a cliff overlooking Montezuma, a little town at the tip of the Nicoya Peninsula on Costa Rica’s central Pacific coast, offers several unusual types of retreats. Among these are Surfing, Aerial Acrobatics, Thai Massage and Yoga Teacher Training, ranging from one to several weeks in length. You don’t have to take any classes at Anamaya- if rooms are available, you can reserve for a night or a week, and relax by the pool overlooking the Pacific. 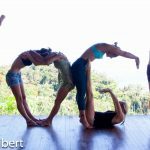 However, for the Yoga teacher training, the entire resort is booked for the class and the entire experience is focused on Yoga. 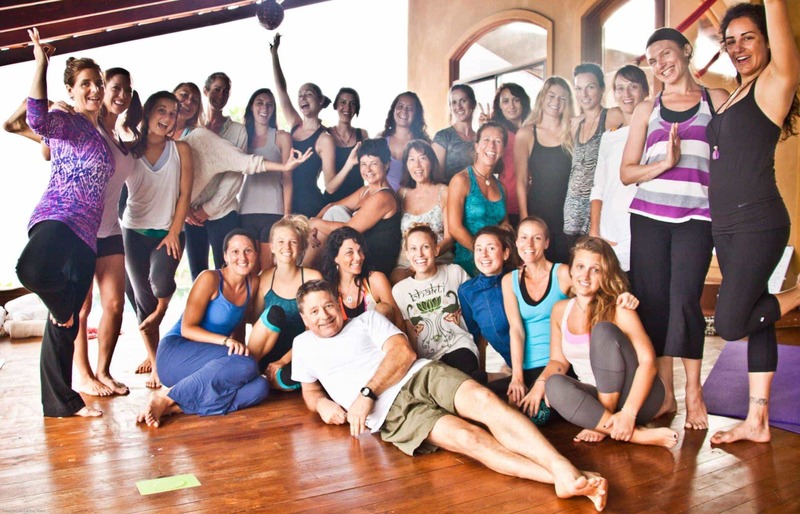 Anamaya’s Yoga retreats are taught by world-class teachers from all over the globe, and offer a variety of specialized programs for students of Yoga. The 200-hour teacher training program qualifies students for a Yoga Alliance teaching certificate. Anamaya is a lovely resort. The food is wonderful- fresh high-quality Costa Rican coffee at breakfast, organic, locally-grown, chef-prepared gourmet meals three times a day, fresh local fruit snacks twice daily, filtered water and a selection of organic teas available anytime. The clean, modern, beautifully-decorated accommodations are comfortable and charming, ranging from individual air-conditioned cabinas with decks and bathrooms, to dorm-style rooms with multiple beds and shared bath. These spaces are laid out on a four acre site and arrayed down the steep hillside, with twisting steps and gravel paths radiating from the main building situated at the center of the hilltop. The views from every window, porch, deck and walkway are spectacular, and the landscaping is a gorgeous profusion of tropical plants mixed with kitchen herb gardens and fruit trees. The main building is a large, high-ceilinged house with huge windows, marble floored dining room and kitchenette, a “living room” with little private sitting spaces, a ground-floor bathroom with outdoor shower under a spreading hibiscus, and upstairs dorm rooms. Most of the rooms look out onto the huge covered yoga deck facing the ocean. The tiled zero-edge pool is to one side of the deck, with a waterfall spilling from the hot-tub above it. The four-person infrared dry sauna is below the pool, with its own deck. There is another deck with table and chairs outside and a few steps away from the dining space, situated on top of the nearest cabina. Out front and to one side of the tree-shaded arrival area is the little office building, and off in another direction are more cabinas with their own porches and decks- each one in a different style. The resort’s kitchen, laundry, and other service facilities, as well as a separate massage space with its own deck, are located beneath the office and a couple of the nearest cabinas. Additional seating nooks, hammocks, and private spaces are scattered around the gardens, and along the access drive is the resort’s maintenance shop. The staff at Anamaya include chefs, cooks, dining room, cleaning, grounds maintenance and office personnel. An eco-resort is an “eco-resort” because of its sustainable practices and policies toward life and the planet on which life depends. These practices include use of organic and locally-grown food, some of which is produced onsite without pesticides or herbicides, using reclaimed and recycled kitchen waste, and recaptured rain and wastewater. Other sustainable, or “green” practices include the non-chlorinated salt-water pools, using non-toxic cleaning products, limiting landscape maintenance and watering to a minimum, minimizing hard-surface pavements like concrete, instead using rain-pervious gravel drives and walks, and having no pets so that the local monkeys, coatis, armadillos and iguanas can roam freely around the grounds. Excursions and activities available in Costa Rica include the well-known jungle preserve and zip-line canopy tours, scuba and snorkeling, surfing and beach-combing, horseback riding, and exploring canyons and climbing waterfalls. Waterfalls and zip-lines are a two-minute walk downhill from Anamaya, and the quaint town of Montezuma, where we went to sample local food and crafts such as artisanal leather and silver work, is just down the dirt road from the resort. We sampled the snorkeling and beach-combing, and those who tried the horseback riding and surfing excursions, and the tours of the local gardens and nature preserves, were thrilled with their choices. We also participated in a “karma” day beach clean-up where we hiked to a section of the beach and picked up the usual assortment of plastic litter for a couple of hours as a way of giving back to the community. Even this activity had its special aspect, as we enjoyed refreshing coconut water from freshly picked coconuts on the beach. A full description of the resort, the local environment, all the lovely people we met, the daily routine, and all the beautiful sights and sounds we experienced in Costa Rica and at our resort would take many more pages, but a brief description of the Yoga Teacher Training experience might be in order. The classes included Philosophy of Yoga, Anatomy, Meditation, and Yoga Principles, plus a special section on Thai Massage. We spent hours each day in yoga workouts, learning the principles of muscular activation and joint support, correct postures and bodily alignments, and methodology of teaching Yoga to others. Much of our time was spent in actual practice teaching with partners, small groups, and the whole class, under the watchful eyes of our instructors. The instructors themselves, one from New York City and one from Copenhagen, Denmark, were highly experienced teachers who each has had their own practice for many years and has studied with many advanced yoga masters around the world. With a combination of skill and gentle compassion, they led us through vigorous workouts as well as meditations up to an hour in length, and demonstrated amazing flexibility and strength in advanced Yoga poses as well as the basics necessary to acquire these skills in our own practices. We also had various activities aimed at exploring our own experiences and personalities with the goal of developing an understanding of other people. As a group, we rapidly achieved a high level of trust and experienced an extraordinary level of personal bonding, which enabled us to work and live together for a month with virtually no friction or discomfort. This may have been the best part of the whole experience-gaining so many new friends from around the world despite language, cultural and age differences. 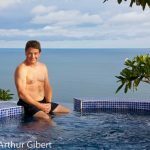 While such a retreat is obviously not for everybody, I would highly recommend this combination of healthy living, exercise, and learning to anyone who would like to experience a profound and intense personal growth and an amazing vacation in a very special part of the world in which we live.